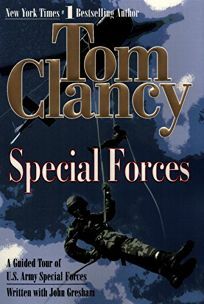 His now legendary reputation in military circles gives Clancy as complete access to events and sources as any civilian can expect. This is the seventh in Clancy's series investigating key institutions of the contemporary U.S. armed forces (Armored Cav; Fighter Wing; etc. ), and the most comprehensive overview of the U.S. Army Special Forces available to general readers. Clancy, writing with regular series collaborator John Gresham, begins with a softball-tossing interview of Gen. Hugh Shelton--books like Clancy's are not written by antagonizing four-star generals--and the Joint Chiefs of Staff chairman establishes Special Forces evolution from the ""snake eaters"" of the Vietnam era to the ""quiet professionals"" described in the rest of Clancy's mostly first-person narrative. The first person is a big selling point here; discussions of equipment, ""extreme"" training and what Special Forces detachments actually do in peace, war and the gray areas in between are based on Clancy's own reportage often enough to maintain the ""guided tour"" conceit. Special Forces are shown training Venezuelan internal security forces, acting as coordinators for fire-support missions in Kuwait, cooperating with conventional U.S. units and, in a near-future scenario, defeating a nuclear-tipped terrorist revolution in Indonesia. Clancy's language slips into jargon often enough to confuse the target audience of interested generalists, and others may be disturbed by the implications of a military instrument able to do the things described here. But despite the drawbacks, Clancy remains a consummate storyteller, and this book is no exception to his oeuvre. (Feb.) Forecast: Pluses: It's a book by Tom Clancy in a series that regularly debuts on paperback bestseller lists. Minuses: It's not really a start-to-finish narrative, but a collection of field notes, albeit highly detailed and often compelling ones. Nitpick: the repeated phrase from title to subtitle reads badly.